A new exhibition featuring Hobart “Hobie” Alter, a Southern California native known for inventing the “Hobie Cat” catamaran and changing the way people use the water for surfing and sailing is on display at John Wayne Airport (JWA). Ticketed passengers can view the exhibit through Spring 2019. Passengers strolling through the Vi Smith Concourse Gallery located on the Departure (upper) Level, across from Gates 2 through 5 in Terminal A, Gates 18 through 21 in Terminal C and in the free-standing display cases across from Gate 14 will have the opportunity to view fun and interesting panel displays depicting Hobie’s achievements. Laguna Beach early 50’s. Hobie and his wife Sharon with friends in a photoshoot for Kodak. This photo would later hang in New York City’s Grand Central station. A young Hobie carries suitable balsa “sticks” to be glued and joined to produce a balsa surfboard blank. The genesis of a surfboard from foam blank to ready for the surf (stages of surfboard production). 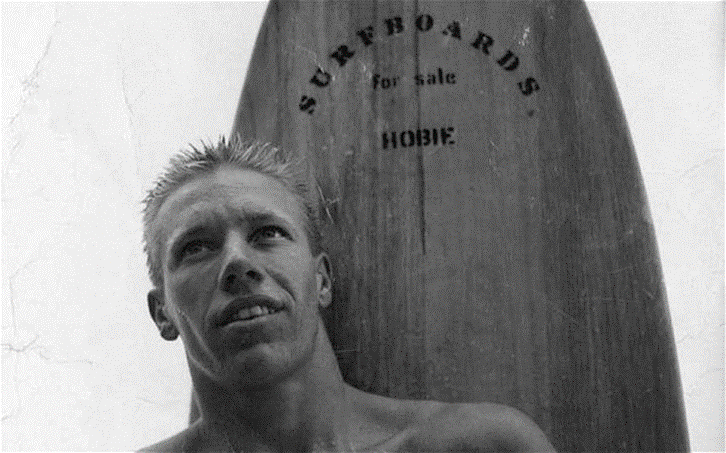 Hobie stands in front a sign he made for the Hobie Surf Shop in Honolulu, Hawaii. Hundreds of surfers and paddlers gathered around a Hobie Cat catamaran off the shore of Doheny State Beach to celebrate the life of surf and sailing entrepreneur and pioneer Hobie Alter.